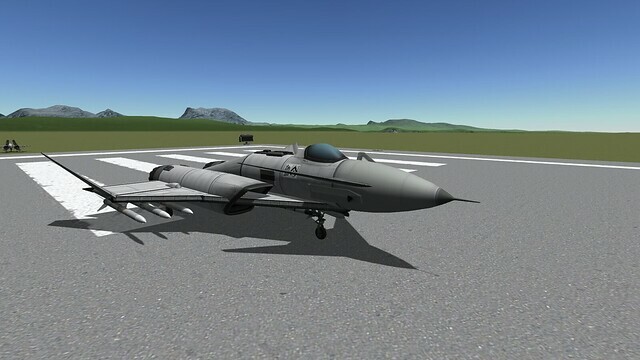 Alan Aerospace Recycling and Packaging presents our third jet fighter and second mostly conventional design. It has a rather high combat takeoff weight of just over 13 tons but that will drop rapidly as your pilots expend ordnance and fuel. The central tank should be kept empty for battle, unless you want to increase takeoff weight and reduce agility. It’s set to empty first in case you have a long flight and need to take a nap before a dogfight. A mod aircraft called Cranky Delta. Built with 68 of the finest parts, its root part is Mark2Cockpit.